Make this easy salmon recipe in just 10 minutes! This easy baked salmon recipe with cilantro and garlic pesto goes together with just 10 minutes preparation time. When you need a spectacular dish for a dinner party or other special occasion, or even just a nice family dinner - but have no time to cook! - this is the dish to make. We usually use fresh salmon filets, but you can also make this recipe with frozen salmon. Just remember to take it out of your freezer the day before you want to cook it, and let it thaw in your refrigerator overnight. 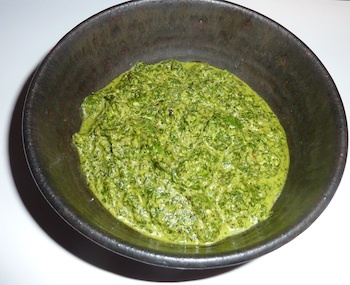 The easy cilantro and garlic pesto is done as soon as you put the ingredients into your blender and press the "on" button. 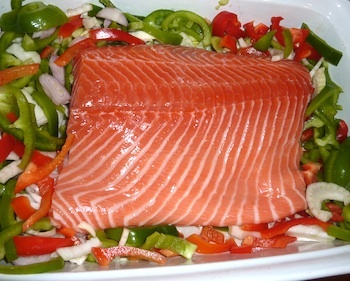 To make a complete dinner, just add chopped veggies (peppers, fennel, and onions work well) to your baking dish around the fish. Make another side dish, like rice pilaf, and your meal is ready! As a bonus, you'll have some of the cilantro and garlic sauce left over - so pop it into the freezer for now. Later, add it to soup for instant "wow!" flavor, or toss it with linguini for a totally easy but delicious dinner. Set the oven to 425°F. You can make the cilantro-garlic pesto a few hours before you're ready to cook the fish - but but to keep the gorgeous bright-green color, add the lime juice right before you're ready to use it. Otherwise, the acid in the juice will turn the pesto olive green. Make the cilantro and garlic pesto by putting the cilantro, cheese, nuts, garlic, lime juice, cayenne, and salt into a food processor. With the motor running, add the olive oil through the feed tube and process until smooth - usually 30-60 seconds. Use a spatula to scrape down the sides of the bowl, process again for a couple of seconds, and you're done. You should have about a cup. Prepare the salmon for baking by spreading a spoonful or two of the pesto on the bottom of a baking dish, and laying the fish on top of it. Spread about half a cup of the pesto on the salmon, covering it completely. This helps seal in the juices and keep the salmon moist. If you're cooking veggies with the salmon, add them to the baking dish. If you want, you can drizzle them with another 1-2 tablespoons olive oil. 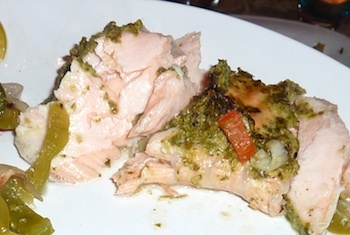 Bake the salmon with cilantro and garlic pesto at 425°F for about 10 - 15 minutes, until the salmon is cooked through. Cooking time depends on the thickness of the salmon. When the thickest part of the salmon becomes opaque (you can test with a fork), it is done. Part of what makes this dish so delicious is how the pesto and the juices from the fish flavor the vegetables while they're cooking for a delicious burst of flavors. Expect your guests to want seconds! and get new recipes in your mailbox each month. Copyright © 2010-2018 Super Seafood Recipes. All rights reserved.